March 15, 2016 (Lincolnshire, IL) – Klein Tools (http://www.kleintools.com), for professionals since 1857, is partnering with Super Rod, a UK-based company, to introduce a series of low-voltage wire pulling products in the US and Canada. Super Rod is a leader in wire installation tools in Europe and is a repeat winner of the Queen's award for innovation. 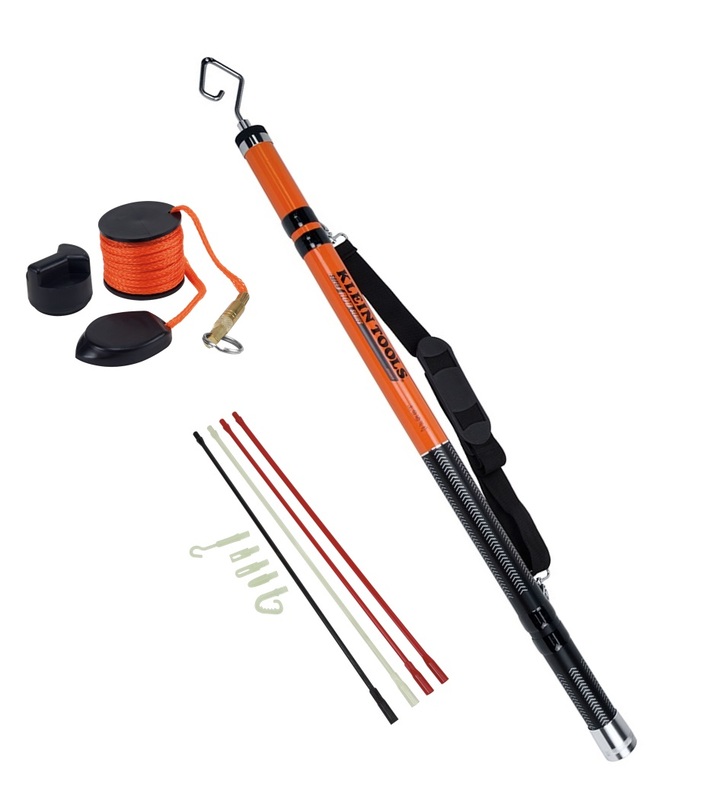 WIRESPANNERplus Telescopic 18' Pole – Designed to allow one person to easily retrieve cables from a distance and has a large hook attachment for pulling multiple wires. It retracts to a compact 32" for easy storage. Primary application: Cable installation (Datacom/communication/safety) and renovation/retrofit installations. Magnetic Wire Pulling System – The leader-pull design allows users to pull cable behind finished walls and other enclosed spaces. It can navigate through insulation and around other obstructions. Primary Application: Cable pulling in renovation/retrofit installations. Polymer Fish Rod Set with Glow-in-the-Dark Leaders – This set includes four non-conductive rods of varying flexibility designed for working around electrically sensitive spaces. Also included are glow-in-the-dark hook and bullet eye attachments for ease of use. Primary Application: Cable locating, retrieval and pulling of short runs. "Klein Tools is always creating and searching for the highest quality tools available for our customers," said Mark Klein, president of Klein Tools. "By partnering with Super Rod we are able to complement our current low voltage wire pulling product line with Super Rod innovations that already have a strong track record on the jobsite in UK. We're confident that this line expansion will fill an existing need in our product catalog and that our customers will immediately see the value in them." For more information, and to watch videos on the WIRESPANNERplus, Magnetic Wire Pulling System and Polymer Fish Rod Set, visit our website at www.kleintools.com or contact your local distributor. Listen, innovate, deliver – Super Rod puts customers at the heart of everything they do. This approach has enabled them to develop the world's leading cable installation system, delivering millions of hours of labor savings for its customers. Focused on the needs of the professional electrician, Super Rod continuously seeks industry innovations to provide the best hand tool solutions for their customers. For more information, visit www.super-rod.co.uk.